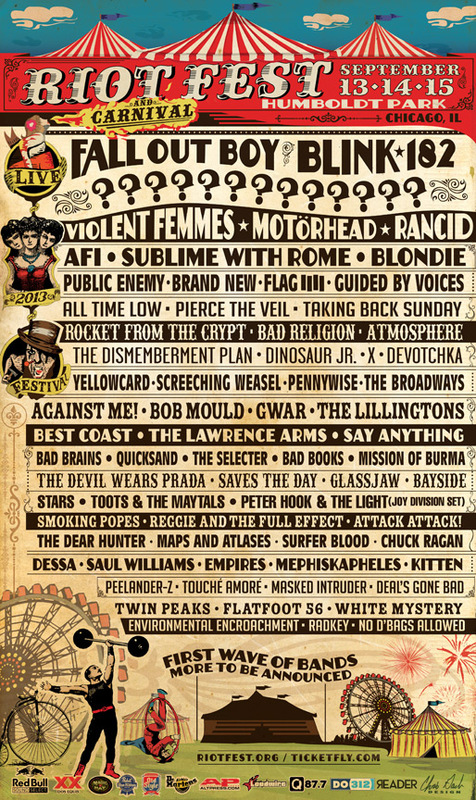 ***UPDATE: Both the Toronto and the Denver Riot Fest lineups were just announced, and lo and behold the Replacements are confirmed to be playing both events. The Chicago lineup has not been updated, but it seems all but certain they will be playing there, too. However, this means their first reunion show will actually be at Toronto's Riot Fest on Sun., Aug. 24 (with Iggy & the Stooges! ), which is three weeks before the Chicago date. Denver's Riot Fest is a weekend after that, Sept. 21-22. Stay tuned for more details. One place to check might be the new Replacements website, which launched concurrently with the fest lineup announcements. The Replacements’ legendarily calamitous decade-long run ended July 4, 1991, at an unceremonious outdoor gig in Chicago. Could that also be where and how remaining members Paul Westerberg and Tommy Stinson go about playing their first-ever reunion gig in 2013? Scheduled Sept. 13-15 in Chicago’s Humboldt Park, Riot Fest has been advertising a mystery slot since its lineup was issued a month ago (“???? ?” on the posters). Internet and social media chatter predictably pointed to the Replacements, among others. Unpredictably, though, reliable sources are not ruling out the rumors that it’s them. There are other indicators that make the Chicago scenario more believable, including the fact that -- by all accounts -- Westerberg and Stinson both had a blast making the “Songs for Slim” tribute EP for former bandmate Slim Dunlap late last year, and it’s still a good/necessary cause for them to promote with a gig. Original drummer Chris Mars also contributed one track for the EP but has always talked as if he's permanently out of the band. Both Westerberg and Stinson, on the other hand, have sounded more open and less cynical about the idea of reuniting in recent months, including a March interview with Time where Tommy said they plan to record again this summer and a new podcast with Tommy that made it all but certain they would work together again. They’ve always scoffed at the paychecks offered to them by bigger, trendier festivals to play their first reunion gig. Riot Fest has more of a punky, underground aesthetic that would suit them, but it is still big enough to at least offer something close to what Coachella might have paid them. Riot Fest’s previous reunion bragging-rights have included the Jesus & Mary Chain, Screeching Weasel and hometown heroes Naked Raygun. Also, there are simple details like the fact that Tommy’s manager, Ben Perlstein of Milwaukee, represents another band playing a rare set at Riot Fest this year, the Smoking Popes. Not to mention, there are no Guns N’ Roses gigs on the books for Stinson to play in September. Best we can tell, Paul’s schedule is open that weekend, too. Of course, anyone who knows the Replacements knows not to count the eggs before they’re hatched (or splattered against a wall?). It sure would be a bummer to pay the $149 price for a Riot Fest pass and instead wind up seeing Fall Out Boy and Blink-182 for headliners, although there are a lot of cool acts listed beneath those names on the lineup, including Motorhead, X – two bands Paul likes! – plus Blondie, Bad Brains, Bob Mould, guided by Voices, Bad Religion, Atmosphere, Toots & the Maytalls, Flag (ex-Black Flag), Rocket From the Crypt, Dinosaur Jr. and Mission of Burma. Two offshoot Riot Fests are also being held this year in Denver (Sept. 21-22) and Toronto (Aug. 24-25), so there could be a chance of them playing those, too. Toronto's lineup is scheduled to be announced tonight at 10 p.m.
Whatever happens, at least this is a good excuse to run another link and remind you to support the entire "Songs for Slim" series.